Of course K is for K'kree. This is Traveller. It was either this or Kinunir. Not much to say about this one. K'kree ships are pretty simple, and if you want to keep it at a printable size you are kind of limited to 1,000 tons. 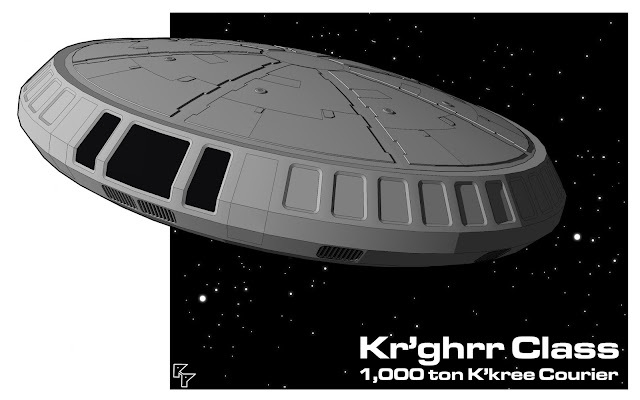 I got about half way done with this, and bemoaning how little source material there is for K'kree ships when I realized I had the GURPS alien book with the K'kree. 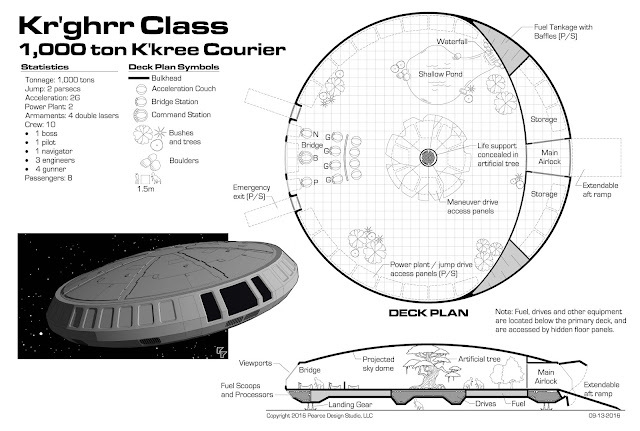 The deck plans are more similar than I'd like, but again - it's a simple layout. I'd never seen a ship detailed with waterfalls and landscaping, so I went with that. Purist and gearheads should note that while this layout is to scale and is an accurate 1,000 tons, I have no idea if the drive and fuel space meet canon ship generation requirements. Just shootin' from the hip this time, folks. Now I've just got to figure out the pronunciation. Is it KIK'-ree or kik-REE'? For a higher resolution PDF, click this link: (Traveller K'kree Starship Courier). The deckplan was created to be printed out on 24"x36". Scale is 1" = 10'-0" so it can be used with 15mm miniatures. Enjoy! Excellent work! You have me coming back every day sir. I want to say it as "K-kree" with a pause with the k's. Also, it'll go 'Boom!' with the first good hit. And slightly used K'kree starships are the booby prize of the Traveller starship market. Yeah, it's a running starship, but's it's unnecessarily large for it's duty. Na, they can as seen here be repurposed to a rather nice yacht or safari ships, maybe a new colony ship...like that one Earth one that got lost on the way to Alpha Centauri back in the early days of starlight something with a J....yeah. Somebody get the SIN on the baby I think they gikked a human colony crew. Yeah, there is some utility for the right Traveller. I can't see the freezer tubes ,the space pod or the magna lock for the B9 Robot on the deck plans.